With just one round-robin game left to play on Thursday, it is still unclear which of five teams will make it through to the men's Page Play-off section of the World Junior Curling Championships, being staged in Sochi, Russia. Scotland did their campaign no harm at all with two wins on Wednesday, beating Sweden by 6-5 in the morning and following that up with another tight win, this time by 5-4 over the bottom-placed Czech Republic. These results put Scotland on the top of the table for the moment, on seven wins, but breathing down their necks - on six wins each - are Russia, who beat the Czechs by 10-3 in the morning session in what was their only game today; Canada, who beat Norway by 9-6 in their only game on Wednesday, in the evening session; and Sweden, who concluded their round-robin programme with a 5-4 victory over Switzerland after losing to Scotland. Scotland, Russia and Canada, as well as Norway - who, on five wins cannot yet be discounted, all play in the final session, while Sweden can only sit and wait. The main crunch game in the closing session sees Russia line-up against Norway, a game which is a must-win for the Norwegians. Scotland, the only team assured of qualification at the moment, face the USA, and a win would see them rank as clear number one to go into the 1-2 Page Play-off. Looking forward to that, Scottish skip, Kyle Smith, said after the Czech game: "One more win tomorrow and we'll be exactly where we want to be." Canada go in against China knowing that a win would give them at least a tie-breaker, while China are effectively playing for pride, as will be Switzerland and Italy who meet in the fourth game of the concluding session. China lost both their games on Wednesday, the first a 6-4 defeat to Italy in the morning and then 8-1 in seven ends to the USA in the evening. These two victories saw both Italy and USA finish the day in joint sixth position with a record of 4-4 with one game left for them to play. After his win against Norway, Canadian skip, Matt Dunstone, reflected on the win that kept their play-off hopes alive and looked forward to his last game. He said: "We know that we can do better than that, but we still had control of the game. That was the positive that we took out of that," adding: "Win and we're in. We just have to do our job there and the rest can sort itself out. We just have to keep it up for tomorrow." 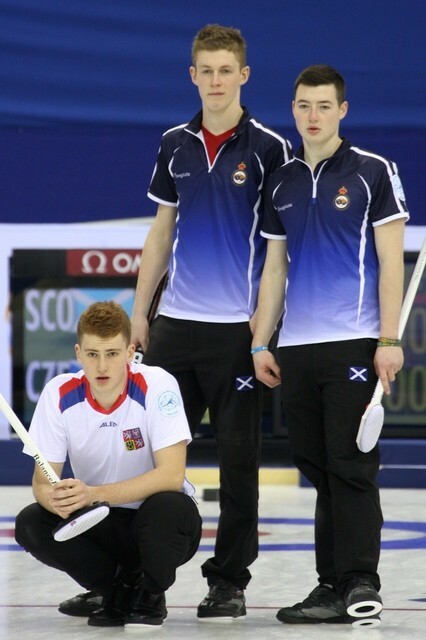 By contrast with the scrap for qualifying places above them, Wednesday's two losses for the Czech Republic meant that they finished their round-robin programme without a win, making them the lowest-ranked European team, now relegated to next season's European Curling Challenge. Session 10: Scotland 6, Sweden 5; Italy 6, China 4; Czech Republic 3, Russia 10. Session 11: China 1, USA 8; Switzerland 4, Sweden 5; Norway 6, Canada 9; Scotland 5, Czech Republic 4. The World Curling Federation (WCF) is the International Sport Federation governing the Olympic Winter Sport of Curling and the Paralympic Winter Sport of Wheelchair Curling. The WCF represents curling internationally by facilitating the co-operation and mutual understanding of a network of 50 member associations. The WCF facilitates the growth of curling, which is carried out through a series of World Championship competitions and official WCF events, camps and courses and financial support programmes. The WCF is one of seven International Sports Federations currently part of the Winter Olympic Programme. The WCF Secretariat is based in Perth, Scotland.